Innovative recruitment company wants to hire a team of our mothers! Hudson, a global recruitment consultancy, is currently partnering with 2to3days to hire brilliant people to join its team of recruitment consultants in its Birmingham and London offices. 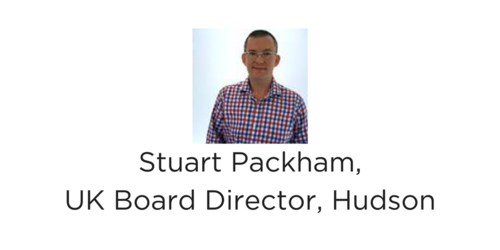 So earlier this week, Juliet caught up with Stuart Packham, UK Board Director, who is driving this initiative, to find out why working for Hudson is a great career choice for people looking for a flexible and collaborative workplace that supports a healthy work-life balance. Why are you looking at the returning talent pool? We completely appreciate that people take time out of work for a wide variety of reasons; having a family is one reason, but people might also take time out to care for relatives or gain different life experiences. The ‘traditional’ career path is changing and having a wide mix of different work and life experiences has become highly sought-after. More often than not, returners to work have developed a rich assortment of life skills which are incredibly valuable to the business world, and more specifically, the recruitment industry. We want people with empathy, learning agility, and a desire to embrace change – and returners often have the attitude and approach we’re looking for, which could include returning mothers amongst your 2to3days network. In fact, over 54% of our workforce are women and a high percentage of these women are mothers, from the Executive down. Hudson is going through a huge transformation, not only in terms of our products, services, and approach to the market, but also in how we work together internally. Globally, Hudson is made up of 2,500 people, and around 250 are based in the UK. Whilst we benefit from being part of a global team, we have integrated our innovative talent management expertise with our recruitment business, helping businesses navigate the whole new world of work by using our in-house tools and solutions. How is the recruitment market changing? Transactional recruitment is disappearing. Instead, we are moving towards a culture where an individual’s and a company’s true purpose will govern how they work and engage with people. Very soon, companies won’t advertise using a standard job description; instead the focus will switch to finding candidates with an ideal set of approaches or attitudes. Employers will list the projects that they want done and candidates will be asked to demonstrate how their ability, desire and life experiences make them the right fit for the role. I don’t believe we have, or will ever have, one single culture; instead, we have a series of sub-cultures that come together to create an organisation connected by a shared purpose. But, generally speaking, we are an incredibly passionate and genuine bunch, and we like to consider ourselves innovative and entrepreneurial, with a high level of trust. If you have trust, you have an incredibly flexible culture. We’re not fans of micromanaging, and this is a very rare quality in the recruitment industry. Also, what is pertinent is that over 50% of the team at Hudson from the top down has some form of flexible working. How does Hudson support working mothers? The best way I can answer this question is to start by clearly stating that our aim is to create a working environment where everyone is able to customise their working pattern to achieve a greater balance. We believe the best way to support working mothers is not by singling them out. They don’t walk through the door on day one and get handed a T-shirt which says ‘I am a working mother – treat me differently’. We have a clear career structure in place that offers everyone the same opportunity to progress, develop and be rewarded – regardless of their working patterns. Only the other day, one of my colleagues, who is a mother, said to me – ‘I didn’t think I would be able to come back into the recruitment industry after just having a baby, and be able to do my job on a flexible basis; but I can at Hudson’. On a practical level, everyone has the IT support they need to work anywhere, so you don’t have to be pinned to your desk. A traditional recruitment company’s KPIs are linked to presenteeism; at Hudson we measure output, not time in the office, and we certainly won’t make you clock in and out every day. Tell us what makes a brilliant consultant? How much of that is background and experience versus personal traits or characteristics? Brilliant consultants are open-minded, embrace change, are customer focused and have a natural drive to work collaboratively both internally and externally across all functions and industry groups. The ones that truly shine have resilience – they don’t fall over as soon as someone says ‘no’, and they are prepared to make mistakes, pick themselves up and start again. As a father what’s the one piece of advice you would give your son or daughter in choosing their career? I believe that traditional career paths will no longer exist in a few years’ time. That’s why I always encourage my daughter to choose a career that enables them to have the opportunity to have a range of different experiences in life – not just the one. If you do something that you enjoy, your self-fulfilment and happiness will flow! For me, the most important thing is that my daughter has the confidence and opportunity to do something that she enjoys and finds rewarding. You can find out more about Hudson here.